ATLANTA — A bitter political battle over access to the polls is consuming the final stretch of the hotly contested Georgia governor's race. Secretary of State Brian Kemp, the Republican nominee, says Democrat Stacey Abrams and liberal allies are fighting for immigrants without legal status to cast ballots in the Nov. 6 midterm elections. Abrams' campaign says that's untrue and Kemp is deliberately twisting her words and her record. It says Kemp is trying to deflect from his own record of making it harder for citizens to vote. The hard-fought and much-watched race pits a Republican backed by President Donald Trump, against a Democrat supported by former president Barack Obama. 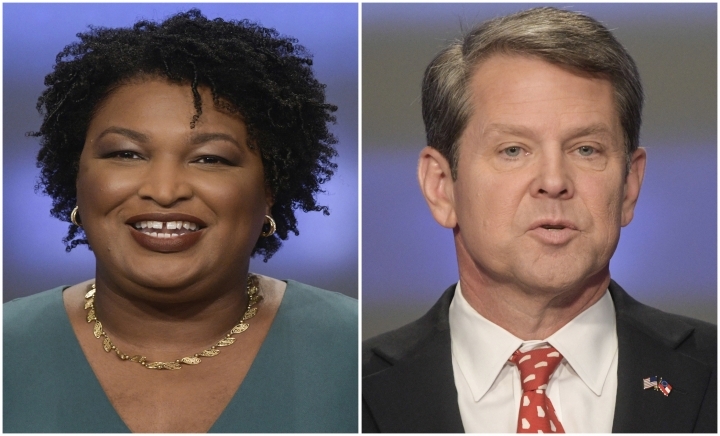 Kemp and Abrams have sparred over voter registration efforts and voting rights for years in the Deep South state. But the tension escalated following an Associated Press report last week that more than 53,000 voter applications were on hold with Kemp's office ahead of the election. Nearly 70 percent of those registrations were from black applicants. As secretary of state, Kemp is responsible for overseeing elections in Georgia. With public polling showing the race in a statistical dead heat and early voting already underway, it's a high-stakes dispute. Abrams and voting rights advocacy groups charged that Kemp is systematically using his office to suppress votes and tilt the election, and that his policies disproportionately affect black and minority voters. Kemp said he was merely following state law. He said the 53,000 Georgians on the "pending" list can still vote by bringing a proper ID that matches their registration information, rectifying the issue in person. Many of the 53,000 wound up on the "pending" list for failing Georgia's "exact match" verification process. Under the policy, information on voter applications must precisely match information on file with the Georgia Department of Driver Services or the Social Security Administration. Election officials can place non-matching applications on hold. Kemp has sought to move past the controversy by swinging hard at Abrams. In an appearance Monday on Fox News, he said a soundbite of Abrams at a recent campaign event is evidence that she wants immigrants without legal status to vote. The clip of Abrams was from a campaign stop in Jonesboro, Georgia last week with U.S. Sen. Elizabeth Warren. During the event, Abrams said: "The thing of it is, is that blue waves aren't blue ... the blue wave is African-American. It's white, it's Latino, it's Asian-Pacific Islander. It is disabled. It is differently abled. It is LGBTQ, it is law enforcement. It is veterans. It is made up of those who have been told they are not worthy of being here. It is comprised of those who are documented and undocumented. It is comprised of those who have been told they're successful and those who have been left behind." During the Fox News interview, Kemp singled out Abrams' words that the blue wave, referring to Democrats aspirations to sweep the November election, includes "those who are documented and undocumented." "Wow. It means she wants illegals to vote in Georgia. This is a shocking development in the campaign. While she was campaigning with Elizabeth Warren she actually said this," Kemp said. "I think hard-working Georgians should decide who their governor is, not people here illegally like my opponent wants." Kemp's campaign said in a statement that Abrams had a record of fighting against measures aimed at making it harder for immigrants without legal status to vote. Abrams' campaign said in a statement that her words were taken out of context and that Kemp was trying to deflect from his own record of creating barriers for legal voters in Georgia. "Kemp is running scared because he knows that Georgians are increasingly excited to vote for Stacey Abrams, and they aren't going to let him steal this election or their futures," said Abrams' spokeswoman Abigail Collazo. During a visit to Athens, Georgia last week to stump for Kemp, Donald Trump Jr. underscored why the race was so important for Republicans, saying that his father's agenda was at stake in the upcoming election. The younger Trump said it's essential for Republicans like Kemp to win important state offices where they can support the President.